Carnival Corporation’s newest cruise line, Fathom, is not just for show. Its impact travel programs have indeed made measurable positive strides in the Dominican Republic thanks to its committed guests, and the numbers have grown during the brand’s first 13 cruises to the region. Thousands of volunteer days have contributed to the updated statistics in the Puerto Plata region along the northern coast. ~ Around 17,500 hours of English interaction have bettered adult and youth students, preparing them for employment and economic opportunities. After all, English proficiency is the number one success criteria for tourism jobs. ~ 730 water filters have been produced and installed in community homes, contributing to healthier conditions free of waterborne illness and cost savings from fewer needed bottled waters for an estimated 3,650 locals. 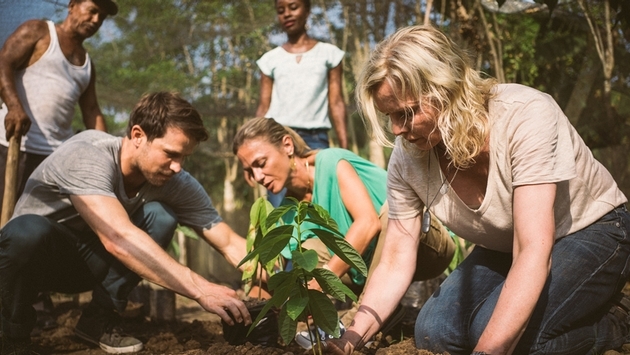 ~ Over 16,000 seedlings and plants have been planted, offsetting traveler environmental impact and reforesting the region for improved soil, air and water quality. ~ 40 homes have received the installation of concrete floors, improving living conditions for hundreds with safer and cleaner conditions over bare dirt. ~ 3,700 pounds of cacao nibs have been cleaned to make over 109,000 chocolate bars, and 57,400 products have been wrapped, packaged and prepared for retail. This contributes to woman-owned business employment and income when it is otherwise limited. ~ Over 9,800 sheets of paper have been produced to increase female income opportunities and independence. The goal of Fathom is to create sustainable transformation in the Dominican Republic and among its travelers. Weeklong roundtrip cruises to the DR from Miami, Florida begin at $299 per person, excluding taxes, fees and port expenses and including all onboard meals, social impact immersion experiences, three shoreside social impact activities and corresponding supplies.